For teachers, “back to school” can convey eagerness and excitement. It can also evoke fear, anxiety, and dread. Few of us have the pleasure of thriving in our schools every day, every year. If we learned of ways to bolster ourselves would we try them? So many encounters can worry us and, our reactions to those worries can stay with us for a long time. We cannot always control the challenges that come our way, but we can be intentional about our reactions to them. Consider, though, the subtle differences between being and doing, between best and better. The intent to do better offers us both action and aim. “I want to enter school each day, aiming to do better.” Being suggests who we are. Doing suggests actions we take. Starting the school year feels like a new beginning. And, it can be. What would you like for your new beginnings this year? Many professionals use a routine to prepare themselves for a meeting, a presentation, the workday. That routine may span reviewing plans and schedules, greeting co-workers, and preparing the workspace for optimal accomplishment. Civility, camaraderie, and composure can take us to our better selves. We can, each day, enter our schools aiming to be mentally and physically kind and strong, generous and judicious, calm and energized. As we prepare for school each day, we can do the same, acknowledging our own personal and professional intentions. Do we prepare for reacting with calm wisdom in difficult moments? Do we avoid perseverating on negative thoughts, frustrations, and self-derision? Do we model the “better self” that helps others in their work? Civility, camaraderie, and composure can take us to our better selves. We can, each day, enter our schools aiming to be mentally and physically kind and strong, generous and judicious, calm and energized. We can choose to do better day by day. Most of us choose different clothing for mowing the lawn, seeing a movie, or attending a ceremony. Do we also consider our clothing choices at school? We are professionals. We are educated, skillful, knowledgeable leaders. Our attire can signal readiness and respect for our workdays and those we encounter there. Some of us may lean toward wearing apparel that is too dressy, too casual, too revealing. Our clothing choices influence not only those who attend and work in our schools, but also the guests, parents, and community members who visit them. Our clothing can influence our mood and our self-respect. Rethinking attire is not a recommendation for an expensive, expansive wardrobe. Appropriate school attire can be clean and simple. The same bottoms may be worn multiple times a week with different tops. Collared shirts can be casual and professional. Comfortable, attractive shoes can substitute for flip-flops and gym shoes. Conflicts big and small occur every day in schools. They are inevitable. At some time during our careers, many of us have said, “I hate conflict!” But, hating conflict, though common, rarely eases it or our reactions to it. Quite the contrary. The more strongly we resist and sulk, the more deeply we sustain the turmoil. Conflict, whether big or small, is often felt deeply. It can consume us! Many of us do not easily shake off perceived slights and, some of us habitually perseverate, playing and replaying the offense long after it has occurred. Who is most hurt by hanging on to the insult or criticism? Not likely the offender. He or she may not even know there was a problem. When attaching ourselves to conflict, we can lose the potential of our “better selves” at school. Holding conflict within us diminishes our effectiveness and often compromises our good health. Enter school with deep breaths of self-assurance and wisdom. Decide not to allow the inevitable conflicts to take you “off your game.” Feel a solid shield of strength. Substitute anger and fear with compassion and curiosity. When attaching ourselves to conflict, we can lose the potential of our “better selves” at school. Holding conflict within us diminishes our effectiveness and often compromises our good health. Don’t be gobbled up by conflict. Notice it. Be curious about it. But, do not let it chisel away at your strength, stamina, and heart for teaching. Not all students want to learn every day, in every class. The more we push them, the less they may be willing to participate. The more we use criticism or compliments to motivate, the more students can resent our efforts to manipulate them. Consider shifting from praise and rewards to enticements that attract and appeal to students’ curiosity. When we capture imaginations, offer solvable puzzles, and provide imagery to ignite possibilities, we entice students to be curious. We make the effort and take the responsibility to lead our students toward learning. We set up possibilities for interesting problem-solving. We think of better ways to prompt interest, curiosity, and humor as we lead our students to solve and imagine. When we entice learners, we help them want to learn. Teachers in schools need not be friends to create a highly effective, respectful, and collegial teaching environment. In the sometimes-fragile ecosystems of schools, functioning respectfully and communicating appropriately may be more valuable than friendships. Sharing personal information and holding out-of-school gatherings can appear to be “one happy family.” Yet, expecting all colleagues to function as friends may be as misguided as expecting the same from students. Being cordial and respectful can contribute to healthy relationships in schools. And, friendly, professional distance can be an important facet of school life and thriving educators. Professor Emerita of Music Education at Oberlin Conservatory, Peggy D. Bennett has spent over 40 years studying the processes of learning and living. Certifications in teaching, mediation, and life-coaching further stimulated interest in how we can, day-by-day, make choices that contribute to wellness for educators, students, parents, administrators, and staff. Author and co-author of 6 books and over 50 pedagogical and research articles, Dr. Bennett has presented her unique brand of teacher education in nearly every state and four continents. 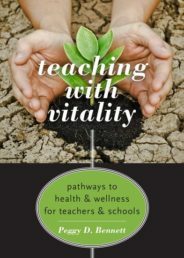 She is the author of Teaching with Vitality: Pathways to Health and Wellness for Teachers and Schools.